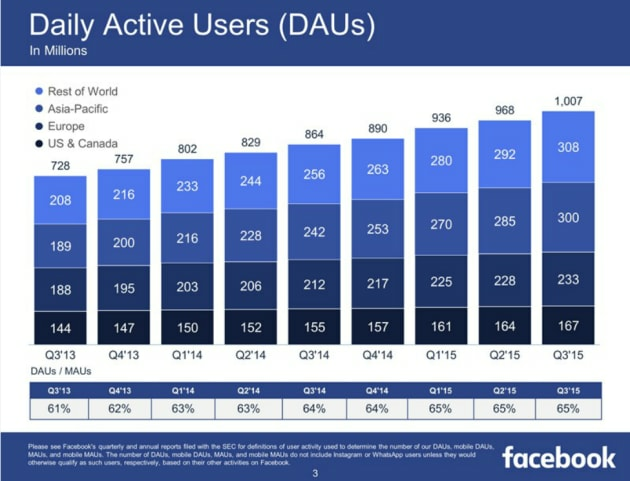 Facebook's growth shows no sign of stopping. Today is announced that it has over one billion users on average using it everyday. In August it announced it had passed a milestone of having one billion users on the site in a single day. By the next month that was the average. That's a year-over-year increase of 17 percent. Monthly active users increased by 14 percent to 1.55 billion as of the end of September, an increase of 14-percent from the year before. Meanwhile the company continues to see a majority (78-percent) of its ad revenue come from mobile. In the earnings statement CEO Mark Zuckerberg stated, "we're focused on innovating and investing for the long term to serve our community and connect the entire world." During today's earnings call, Zuckerberg announced that the company will continue to push hard to be a destination for video. He believes will become more engaging in the coming years especially short form clips. With an incredible eight billion video views a day on the social network, it'll be interesting to see how video evolves on the service. Zuckerberg noted that its still early days. Of course it should be noted that watching something for three seconds counts as a view. Still, it has the eyeballs. COO Sheryl Sandberg took a swipe at YouTube saying that Facebook video targeting beats other platforms. 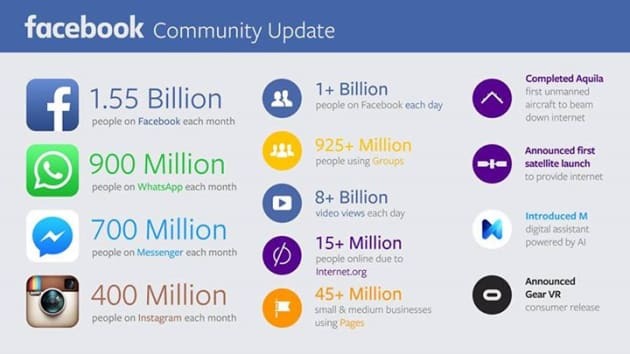 Zuckerberg also announced that 80 million photos a day are shared on Instagram and 9.5 billion pics are sent a month on Messenger. Incredible numbers, but to investors the only thing that really counts is the $4.5 billion in revenue the company made this quarter, a 41-percent increase from this time last year. The profit from that revenue was $896 million.